This outfit lets you form nicely shaped arms and legs, even when your legs are at 180 degrees. Kimberly is wearing Black Bloomers Pants, Body Wrappers, Style 746, $19.99; Cross Over Neck Leotard, Color GNT, Style P500 from the Premiere Collection by Body Wrappers, $39.99; and a Green, Echauffement from the Knits Collection by Sansha, Style K5406, $39.99. 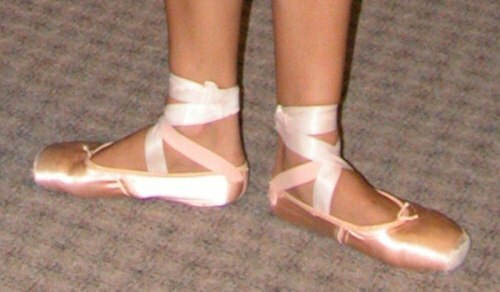 Freed of London Classics Pointe Shoes.